Soldiers from the 3rd U.S. Infantry Regiment (The Old Guard) and the 1st Infantry Division Sustainment Brigade took first place in the male and female categories at the Battle Challenge obstacle course during the Association of the U.S. Army Annual Meeting and Exposition in Washington, D.C.
First Lt. Harrison Barber, with the Old Guard, posted the overall fastest time of 1:34.40. Winning the female category was Cpl. Kristen Gray, with a time of 2:42.33. Sgt. 1st Class Brendan Shannon had the second-best overall time of 1:34.42, and Sgt. Laura Goodwin was the female runner-up, completing the course in 3:11.78. The Battle Challenge was a new event at this year’s Annual Meeting. 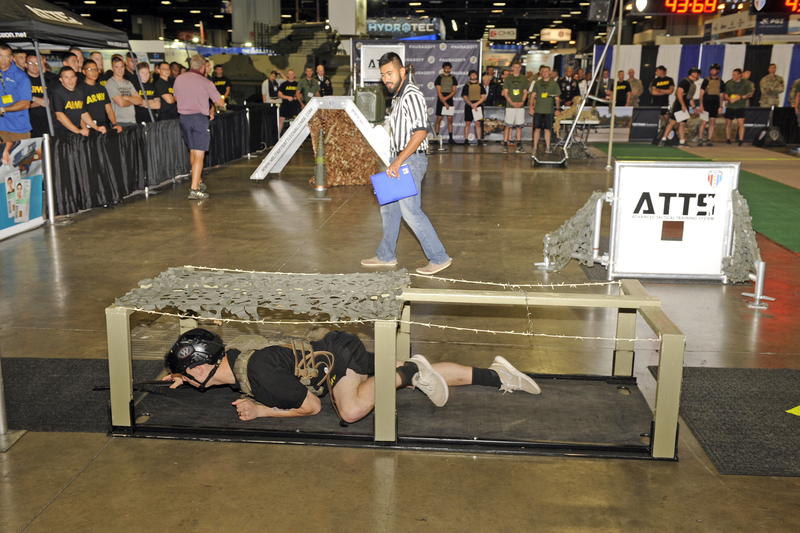 The course, in an AUSA exhibit hall at the Walter E. Washington Convention Center, consisted of nine individual tasks, including climbing a cargo net, descending on a knotted rope, scaling a wall, crossing horizontal bars, toting fuel cans, shooting an M4 laser rifle and dragging a mannequin. Sgt. Maj. of the Army Daniel Dailey led more than 60 soldiers through the Battle Challenge on Monday, Oct. 9, the first day of the Annual Meeting, replacing what had been a traditional run with the sergeant major of the Army followed by breakfast and a speech. “It looks short, but I’ll tell you it’s high intensity,” said Dailey, who predicted the event is here to stay because it’s relevant to what soldiers do every day. “This is pretty cool, beats a breakfast,” said retired Gen. Carter Ham, AUSA president and CEO, while watching soldiers complete the Battle Challenge. In total, over 320 service members competed in the Battle Challenge during the three-day Annual Meeting.